Beau Ski Apartment 54sq.m. Tastefully decorated with a large stone fire place. Balcony. Great location close to everything. Ski locker and free parking. Amazing views from every room.Situated in Les Chartreux this is a quite spot on the golf course and is considered the best place to be.In Summer its perfect and i highly recommend for a summer holiday. The apartment is on the first floor and is extremely warm and has the added bonus of an open fire place logs to be bought by clients and never to be left on when vacating the apartment . The kitchen is very well equipped and has everything you need. the Bathroom is large and has a separate shower and bath and is retro in decor.There is a separate toilet.There is a double bedroom and a bunk bed room. Also a sofa bed in the lounge . 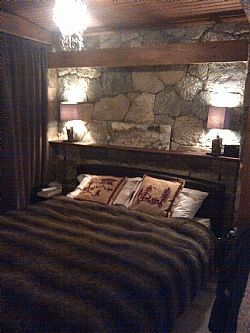 I have a very cozy apartment in Tignes Val Claret with amazing views. and an open fire which gives the feel of a small Chalet. Ski back right to the door.We have been skiing in Tignes since 2000. Our Kids have grown up here. This apartment works really well for a family of 4 or 5.Free parking outside the door.The bathroom is large with a washing machine. Seperate shower and bath. Espace killy ski area. 300 km of pistes for all levels. We also have 2 Barns at Watergate bay Cornwall for surfing and body boarding. Barn cottage and the Mini Barn, together they sleep 13.Big barn 7 mini barn 3/4. We use both these as holiday homes. They are very popular and we have regular visitors to both. I have had an Apartment in Tignes since 2000, Call us and you won't regret it. The ski area has everything to offer beginners and advanced skiers.The apartment is really quirky and retro . Between la Lac and Val claret. Walk to Val Claret. Long walk to La Lac. Free buses run every 3 mins in to the night. Free parking outside the door. Balcony for the smokers. My Friends and I still say its one of the best apartments in Tignes. Ski back to the door. Large beautiful retro bathroom with separate shower and bath. Large sink unit with mirror and light surround. Tiled mosaic wall to ceiling. Washing machine. Separate WC also tiled wall-to-ceiling. Large window with views. Fireplace, DVD, 2 brown leather sofas that turn into a large sofa bed. Leather coffee table. Door to balcony. Windows and shelving. Open plan to the kitchen. Large dining Fully equipped kitchen, table will sit 7 with 2 benches and stool. Radio CD. Ski in to the door. Access to 8 Ski lifts, in the morning a 2 min bus ride, from out side the door. Buses every 3 mins. Ski area Tignes and Val d Isere Espace Killy. 300 kilometers of skiing. Next to 9 hole golf course and mini golf. Notes on accommodation: Suitable for children. Outside: Cars can be parked outside apartment at no extra cost. Balcony has room for a BBQ in the summer. Utility Room: Washing machine in bathroom. Cleaning / Towels / Linen / Maid service: Linen 19 euros per person to be paid in Tignes. Cleaning on top at the end of your stay cash 80 euros. Other: Seperate loo. It was a lovely apartment, warm and with plenty of space for 5 of us. The bathroom is the best bathroom I have ever met skiing with both a spacious bath AND an excellent shower. Kitchen was well equipped which was essential as we all cooked. The buses run very regularly and are so close that walking was minimal. It all meant that we had a really good week. We had a super week staying at Chalet Cafetan for Christmas 2013. Lovely apartment - spacious bathroom and lovely big table we could all sit at. 4 adults stayed but could easily have added a couple of children without a problem. The owner was very helpful - responding immediately to text message and the apartment is beautifully presented. Although not possible to ski out, you can ski in and the bus stop is literally just in front of the apartment. Val Claret and Le Lac are both easy walking distance. 5 stars from us on all fronts! - would definitely stay again. Mountain biking, climbing, walking, tennis, riding, white water rafting, forest climbing, skiing on the glacier, golf and fishing. Fly into Geniva, 3 hour drive up to Tignes. Grenoble and Lyon 2 half hours drive. Chambrey airport. Transfers available if not driving, from Tignes website. By train to Bourg St Maurice from London - Paris. Cool Bus Transfers. Bourg st Maurice 40 mins drive. Ski or drive Val D Isere. Eveything else walking and ski distance. Great restaurant, bars and nightlife all within walking distance. Also a pool Gym and spa close by. Tignes health and fitness centre a very short bus ride. Val Claret and Tignes have everything you should need to make your skiing holiday perfect. In the summer the location next to the golf course makes it the most beautiful place in Tignes to be. Booking Notes: Book direct through me Sandy. To hold the booking full payment by Bacs into my French bank account. Winter tends to get booked up very quickly. December though till May. Early bookings in October/November will be accepted. Summer is from July till the end of August.I also take bookings out of season for training staff . Changeover Day: Changeover day is flexible. Cheeper to travel by plane on a Sunday or week day. Also no que up the mountain.